An old postcard of the State Silk Museum, Tbilisi. It looks very much the same today. On the left bank of the Mtkvari river, Tbilisi, is a small gem of a museum - the State Silk Museum. Although there are numerous silk museums in Europe and Asia, only this Georgian one, founded in the 19th century, still resides in the building specifically for the museum's purpose. For centuries Georgia had its own flourishing silk industry. 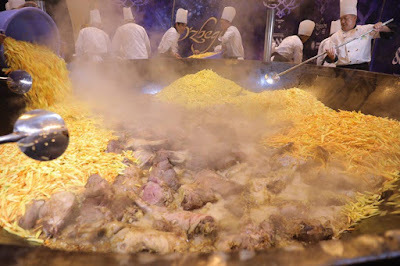 - remember it was also part of the Silk Road - and was a source of silk for the Russian Empire. The Caucasian Silk Station was founded in 1887 under the leadership of the renowned naturalist, Nikolay Shavrov. 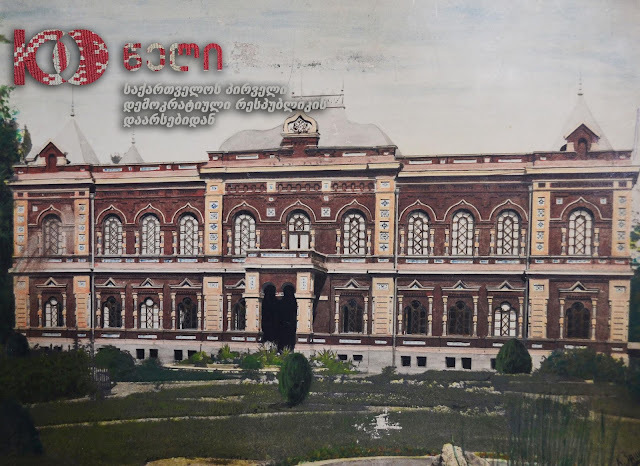 It was with his direct engagement that the complex was built during 1890-1892 at the end of Mikhail Street, what is now Davit Aghmashenebeli Avenue, within the Mushtaid Gardens. Originally it housed a cocoon house, silk spinning and reeling mills, a silkworm nursery and other structures. The main building, which clearly dominates the complex, survives in an authentic shape. It is one of the finest works of Tbilisi architecture of the late 19th century and is listed as a monument of national significance. As architectural historian Maia Mania writes: "... the entire complex, was designed by an architect of Polish origin, Alexander Szymkiewicz, who then worked in Tbilisi. Szymkiewicz is responsible for numerous public and residential buildings erected in Tbilisi in the second half of the 19th century. Stylistically, the building represents a fusion of traditions, with its façade and elevations displaying features typical of the so-called Russian style, Classicism, and Gothic and Islamic arts. Of particular note is the interior adornment which, apart from architectural decoration, includes designed elements, such as a frieze, a cornice, a pilaster and a capital, all of which display silk related features including a mulberry leave, a silkworm, a silkworm cocoon and a pupa". 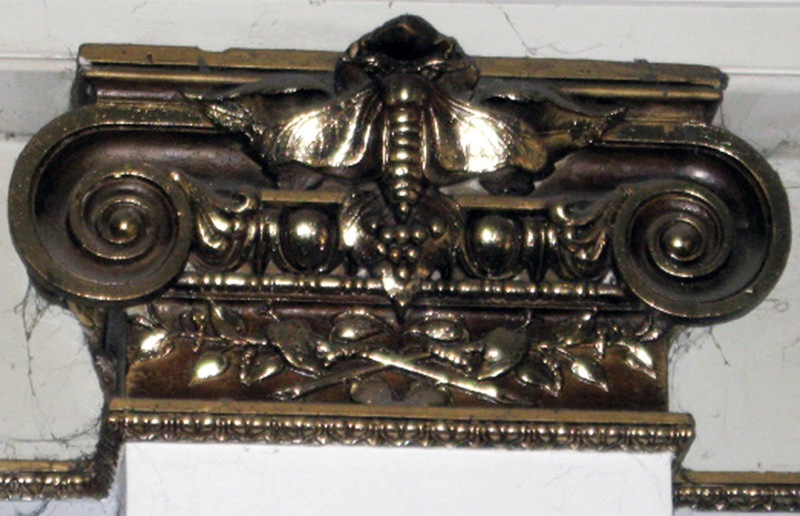 Alexander Szymkiewicz also designed all the library furniture and display cabinets: these remain intact today. They were built in the wood workshop of the museum's basement. 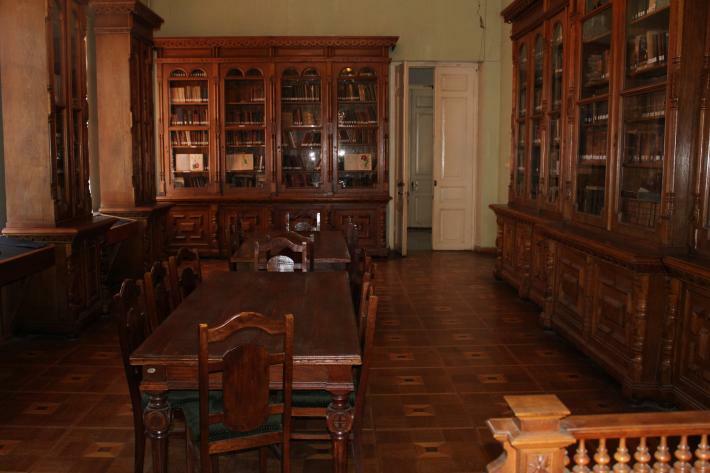 The library includes around 20,000 volumes related to silk farming and natural sciences in many languages. Visitors are welcome to use the library's resources - though note that there is no photocopier. Dyes: there are 144 exhibits collected at the end of the 19th century,. They were imported from 16 countries. Most of them are plant, organic and mineral dyes, with some synthetic dyes added from a later period. Silkworm eggs containers: countries exchanged silkworm eggs for centuries and special perforated transportation containers were created. The museum's 125 box collection testifies to the international trading relationships that the Caucasian Sericulture Station had in the past. Charming reproductions are available as souvenirs. 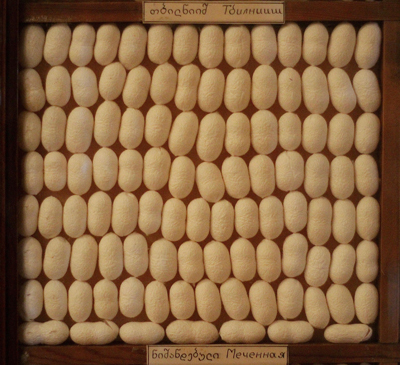 Silk cocoons: most of the 5,000 different varieties were collected in the 1880 - 1890s from over 20 countries. This diversity once again demonstrates the scale of international contacts that the Caucasian Sericulture Station had across the world. 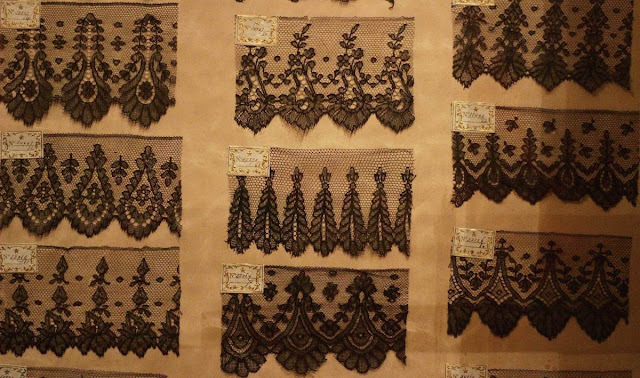 In addition, there is the Jacquard textile collection of almost than 100 patterns, which was brought from France in the 1890s. The Jejimi collection, a Caucasian silk textile usually produced at home in the 19th century, has 45 samples. The lace collection was imported from Munich at the end of the 19th century and consists of almost 400 samples of lace - one of the world's most unique collections. There is a section devoted to the mulberry tree dating from the 19th century and the rich photo collection, depicting silk and mulberry farming in the Caucasus, were taken by the photogpapher Konstantine Zanis. He was actively involved in scientific expeditions organised by the Caucasian Sericulture Station and this museum is the only place that Zanis' entire collection can be viewed. 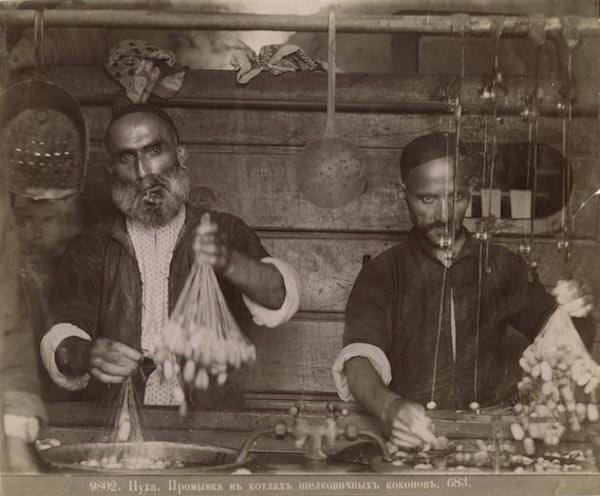 The Georgian silk industry collapsed at the end of the 20th century. There are small steps toward reviving it and entrepreneurs await what the governmental strategy for silk's renaissance will unveil in terms of opportunities. 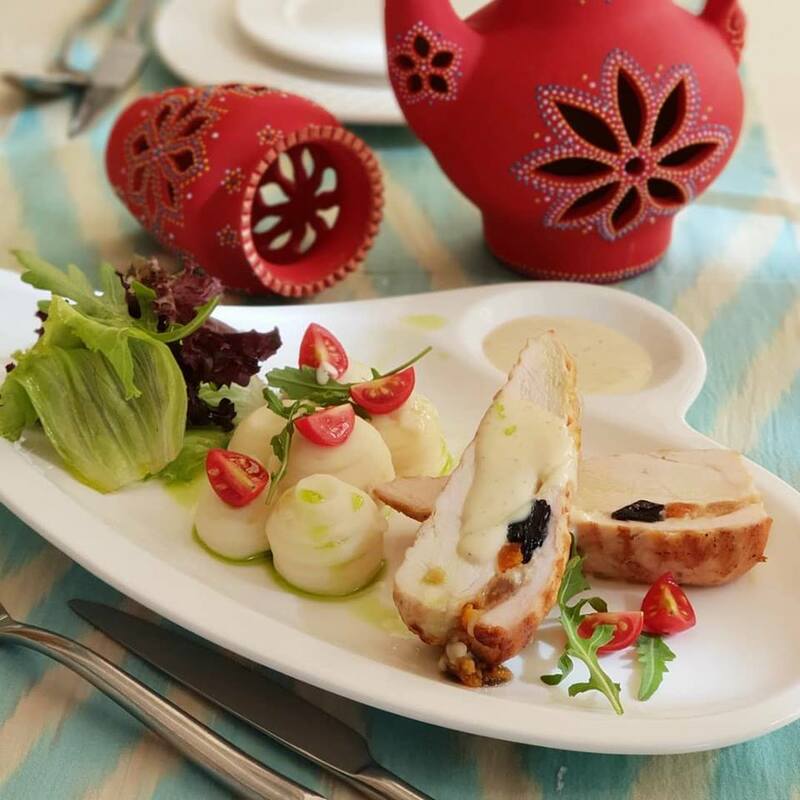 Dilyara Kaipova, whom I think is Uzbekistan's most innovative textile designer, undertook a residency in Tbilisi with the State Sik Museum in 2018 and conducted master classes there. 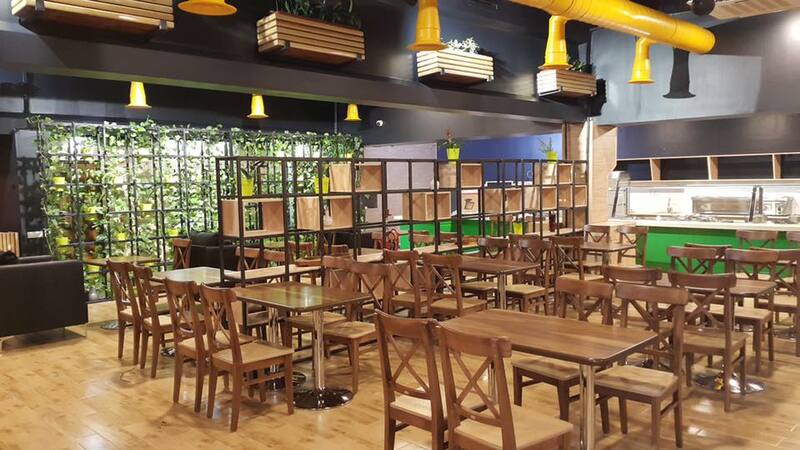 Address: 6 Tsabadze Street, Tbilisi next to the stadium Dynamo. Easily reached by bus from downtown Tbilisi or a 10-minute walk from Station Square metro station. Opening hours: Tuesday to Sunday from 11:00 a.m. - 5:00 p.m.
As many Uzbek Journeys travellers know, the Grand Orzu Hotel in Tashkent was my home away from home. For many years I stayed there, always in suite #48. I had made peace with the curtains, the noisy and almost broken air conditioners, the towel rack that regularly fell down. I replaced the dreary paintings with artworks from friends. So why did I stay there? And why did I use this hotel as the Tashkent base for my clients until just two years ago? Because the staff were wonderful: what they may have lacked in expertise they readily made up for in enthusiasm and sweetness. (Once I caught the flu and the restaurant manager herself made chicken noodle soup and brought it to my room). The staff were all well-educated people, who, although during Soviet times had professional work, now needed better paying jobs, e.g. my cleaner Oksana was a meteorologist. Another had been a language teacher and helped me with my Russian homework. There was nothing "slick" about the Grand Orzu or the people who worked there, but the atmosphere was special. 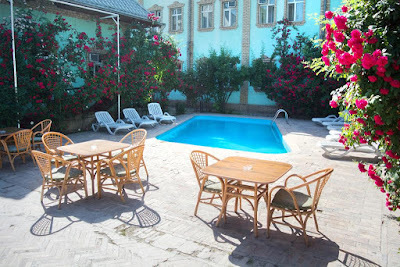 The courtyard was exceptional and very rare in Tashkent. Climbing red roses bloomed twice a year and surrounded the small, refreshing swimming pool. Traditional tapchans (raised platforms for eating and sleeping) edged the courtyard. How lovely to sit there in the evening, sipping a beer or wine. The location was super: Caravan restaurant just across the road as well as Georgian, Japanese and Central Asian cafes nearby. It was an easy 20-minute walk to the State Fine Art Museum, Babur Park 5 minutes by foot, Ulughbek Holmuradov's jewellery boutique just around the corner and Askiya bazaar a further 5 minute walk from there. And now it has closed its doors. 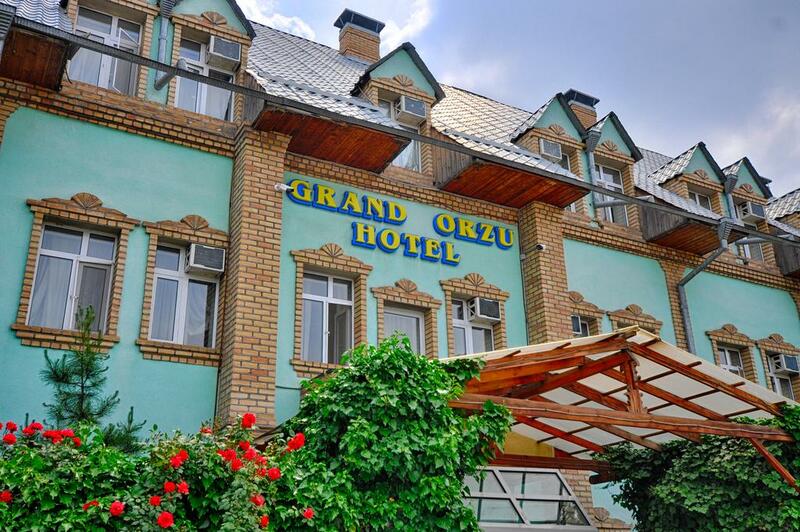 A new Grand Orzu will open in 2020 in nearby Nukus Street. The original building is slated for demolition soon. 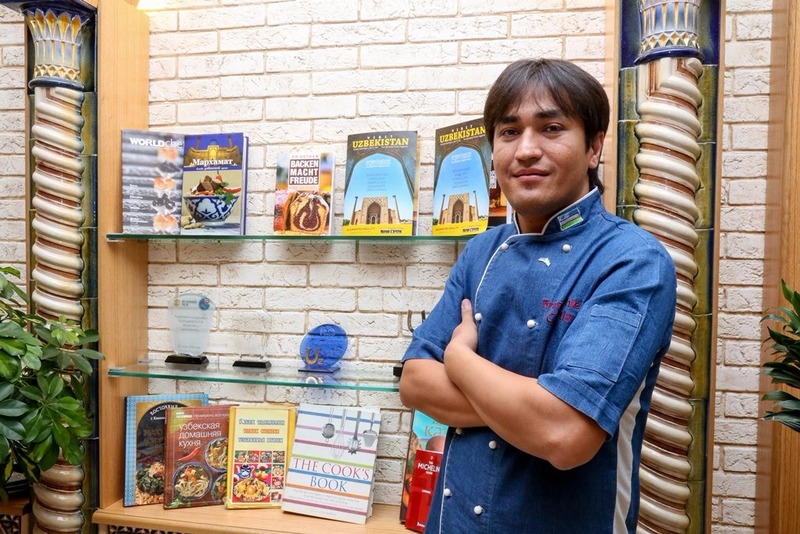 Like all the Central Asian capitals, land is expensive. Too expensive for a small, cosy hotel. The space will house a multi-storey apartment block. 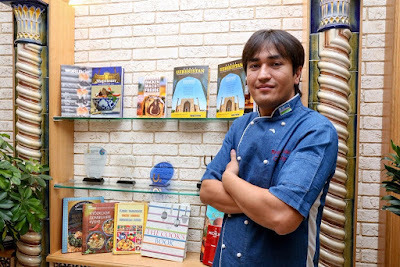 To all the staff who looked after me, I thank you and hope that you have found work in Tashkent that suits your skills. To my travellers who were sometimes a little taken aback by its "on-the-verge" of shabbiness, thank you for not complaining too loudly.